Being a game changer is in our DNA. At Symbios Consulting our business is about helping our clients to transform change into opportunities. We are a European start up culture dating back to 1999 in the UK with deep emphasis on implementation of Lean Systems and 6 Sigma Strategies and Deployment Models. Symbios Consulting Egypt was later on established in August 2005, mostly to serve the Egyptian market, but also the region. Our expert founders excel in production systems design, supply chain configuration, as well as business excellence and development models. We are a Training and Consulting company dedicated to our values, our management, our network that all intertwine to achieve an execution of shared value growth for our clients across all industries. As a Global consulting company we are committed to excellence. Symbios Consulting generates strategies to strengthen core competencies, develops new business models considering the technological possibilities while creating a realistic roadmap for digital transformation and digital interconnectedness, like safeguarding the quality of our consultancy services in the field of Industry 4.0 as one example. Through coaching, we enable businesses to realize the roadmap in short and fast steps. By prototyping, new solutions can be safely tested for their feasibility. Our Operations practice assists our clients in solving complex operational challenges. Blending strategic thinking with hands-on practicality, our teams of consultants and experts work to develop and implement operational strategies that solve our clients' most critical problems. Responding to the digital challenge that companies now face on a global scale, we are seeking to leverage digital efforts and bring them to the next level. The Digital Operations group combines strategic thinking and technology expertise to deliver accelerated outcomes. We help clients separate digital opportunity from hype and we build business prototypes in order to prove that opportunities are real. We also orchestrate delivery to ensure that technology investment translates into business results. We work to configure organizations so they can achieve rapid improvements in customer experience, innovation, revenue, and costs. You will help leaders translate their digital vision into a prioritized set of value-rich opportunities and help determine how organizations can be set up for success in a digital world. We have a local presence and a global know-how, our international offices are in Egypt, the UAE, KSA and in the USA, so getting in touch with our experts is easy – wherever you are. 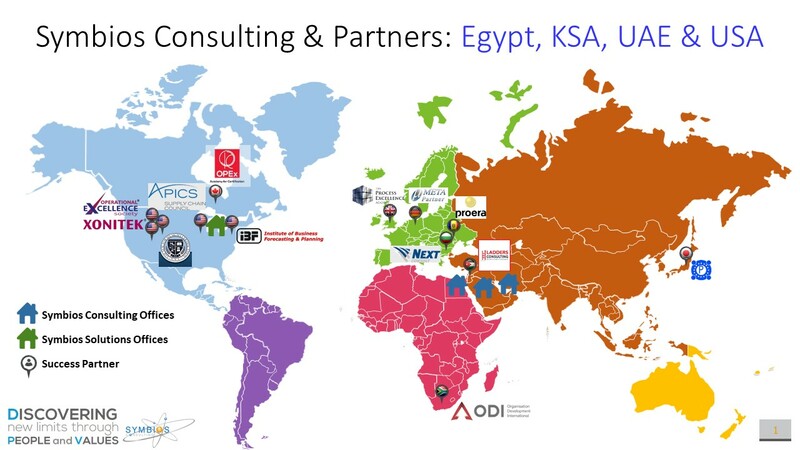 Symbios Consulting Group was originally set up in UK and is currently operating throughout the Middle East and North Africa. Symbios Consulting has become the preferred choice by companies who are demanding saving, culture change and sustainable performance improvement. Symbios Consulting Group deliver training, consultancy and deployment of lean, six sigma, and supply chain operations cross industries such as manufacturing, banking, healthcare and cell centers. The methodologies use fit multi country deployment and different culture contexts. Our programmes are delivered in English and Arabic. Symbios Consulting has delivered training and consultancy service to more than 200 companies worldwide through more than 1,000 Lean, Six Sigma and Supply Chain projects performed by trained Green Belt, and Black Belt. 2. Why are we different? • Consultancy service and training, which are dedicated to ensure share holder value and business transformation and improvement. • The full suite of Supply Chain, Lean and Six Sigma which are complimentary strategies for improvement where it fits in a coherent manner. • A value based orientation to achievable and far stretching operation Strategies- extending to new product introduction processes. • A deep deployment expertise which is focused on the long term sustainable improvement with the client rather than the short term quick wins. • An ability to tailor solutions based upon our proven foundations of strength and capability.